I don’t care for graffiti, but on a morning walk I spotted one scribble that shares a profound bit of truth – not only about interpersonal relationships but also about branding. 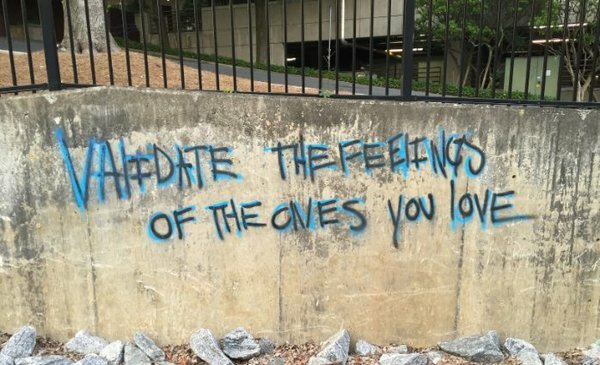 By “validating the feelings of the ones you love” as the graffiti philosopher reminds us, you’re talking about having empathy. Empathy is that amazing bridge that bonds relationships. It means you understand the other person. You “know where they’re coming from” or “I get that.” That’s all we want to hear. Message sent – and message received, with caring and reassurance. This is so incredibly important in branding, too. Brands exist in that mystical, magnetic force between consumer and brand. That bond can only be established and maintained through understanding of the consumer’s desires and needs. In that way, brands empathize with their consumer and seek to validate those feelings through the delivery of the brand in messaging, marketing, co-branding, special offers, added enhancements, brand extensions and so on. The more empathy, the more validation. The more validation, the deeper the relationship. The deeper the relationship, the more commercial success of the brand through the return of repeated purchase, loyalty, advocacy, and ultimately cult status. They fail to understand who the customer is and what the customer’s needs are, beyond demographic snapshots or superficial anecdotes. They fail to listen and address customer feedback in meaningful ways. They fail to communicate in a manner and in places the customer understands and is willing and ready to receive those messages. They fail to set realistic expectations and over-promise, setting up ultimate disappointment and disenchantment with the brand. Perhaps the most demonstrable textbook use of brand empathy is the Dove “Real Beauty” campaign launched in 2004 by Unilever. In one fell swoop, the brand took the unprecedented step of acknowledging what their customers already knew: All women don’t look like fashion models. This was a breathtaking display of empathy and validation for the very customers the brand loves: women. To quote the campaign’s mission strategy: “To make women feel comfortable in the skin they are in, to create a world where beauty is a source of confidence and not anxiety.” Pure empathy. And it should also be noted, this strategy was determined after three years of research. 1. Does your brand have true empathy for your customer? 2. For that matter, do you truly know your customer? 3. And if asked, would your customer say that your brand understands them? Even anticipates their needs? 4. Do you reach your customer on their terms, and in their language? 5. Are you fully engaged with your customer at every point of contact?